I swear, I'm not on Evite's payroll. 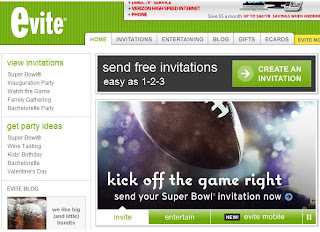 In your opinion, what's the best way to invite people to your party? Is Facebook the way to go? Is it better to just use personal emails? Are paper invitations completely outdated? Help! 1) Personal invitations are great but . . .
One of the best things about Evite is that you can see who's coming. This means 1) you can easily avoid your evil exes and 2) you are less likely to mention the party to people who aren't invited. Because that can get really awkward for the host. Also, personal emails tend to get lost in the shuffle. Even if you're psyched to go to an event, once it gets buried under other emails, you're likely to forget. Or, if you remember, you're going to have to dig through your inbox to find all the details about when/where/what to bring. That can get annoying. What about emailing the group, you say? So that everyone can see who's invited? That brings the annoyance of "reply-all." Then even if you can't go, you're stuck hearing about logistical issues that don't affect you. For a small, informal get-together? Sure, a personal email will do. Following up with people who didn't reply to the Evite? Yes, definitely, a personalized email is just the thing. Don't get me wrong, I love Facebook for a lot of reasons. And Facebook invitations are useful for events - like band gigs, theatrical productions, gallery openings, etc. - where you're able to invite all 545 of your friends. However, Facebook is problematic for a couple of reasons. For one thing, it feels like junk mail. When everyone is constantly inviting all 545 of their friends to every event, people have trouble paying attention. Even when there's an event you've agreed to go to, it gets buried under loads of other invites - so again, you're combing through your event inbox. On the other hand, the best thing about Evite is that all your events are right there, easily organized, with no clutter. It takes you two seconds to see what you've committed to. Secondly, thanks to a new Facebook feature, as soon as you agree to go to an event, you are automatically a member of the "conversation" - meaning that you are potentially listening to 1,000 theater-goers discussing how they're going to get to the show, how sorry they are they can't make it, etc. Facebook basically provides disinsentives for ever saying yes to any event. If you are planning on using paper invitations, I salute you! They're fun to receive, and fun to stick on your fridge. And for a significant event - Bar Mitzvah, Bridal Shower, Wedding - they make a great keepsake, and are completely worth the effort. However, paper invitations for an ordinary party are pretty daunting. For one thing, you'll have to track down everyone's physical addresses. You'll need to design your invitation and have it printed, or you'll need to buy blank invitations (Paper Source has some great ones) and figure out how to print them at home. Then you'll have to address envelopes, pay for postage, and mail them far enough in advance for people to get them in time. If you are the sort of person who is organized enough to get this process started six weeks in advance AND you happen to have mailing addresses for all your close friends, then don't let me stand in your way! But if you're like the majority of us disorganized and frantic people living in the digital age, spend 15 minutes putting together a nice Evite, and you will be just fine. Having trouble figuring out how many of your guests will actually show up? Check out our article here.